Backpacking background: I started backpacking two years ago with my wife and two children (ages 8 and 10 at the time). We have been car camping for 20+ years. Most of our backpacking has been three season camping in the Sierras, 6000-12,000 ft (1800 m -3658 m) and on the Northern California Coast. We do a combination of car camping and backpacking where we will setup car camp for a few days and then backpack 3-5 days with lots of day hikes in between. Our family recently switched from one 4 person tent to using two 2 person tents. I usually carry most of the weight and my internal frame pack weighs between 40-50 pounds (18-22kg). I have owned this shirt four months and have worn it on icy mornings and warm afternoons. This shirt is worn two to three times a week in various activities ranging from lounging around the house, jogging on the streets and Cross Country, hiking the local state parks and backpacking. I bought this shirt for a base or mid layer for backpacking but also like to use it for day to day activities. As a mid layer I wear a soft shell jacket over it to block the wind. I have a long torso and often I need to wear a large shirt or pullover so that the bottom will reach past my waist. Also on Medium shirts the sleeves can be slightly short on me. This medium size shirt fits me well in the torso, covering my waist and blocking any cold air that would come under the bottom of the shirt. The bottom of the shirt is also tight but stretchy. The sleeves come down just past my wrist and are snug enough to keep air out but not too snug that they are a bother. The PowerShirt is warm by itself and very warm with an undershirt. I have found myself too warm on occasion while jogging until I remember the half zip on the front of the shirt. 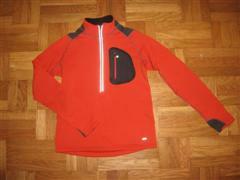 I have several running shirts with a quarter zip of the front that I use for ventilation. 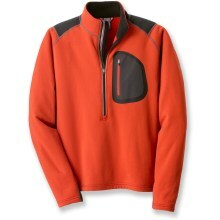 The half zip on this shirt makes for a wide range of ventilation or warmth settings. While jogging I can zip the zipper all the way down to ventilate and when I stop for my cool down I zip the zipper up to the top of the high collar which keeps my body heat from escaping. The fabric is very soft and warm on the inside and soft on the outside. Almost a smooth as a softshell jacket but softer and not as good at cutting the wind as a softshell .The outside does not collect lint, leaves, dirt, etc like fleece does. This shirt is so soft and breathable that I have found myself sleeping in it on more than one occasion. I am able to get a good night sleep in it because of flat seams and soft outer shell with nothing to snag on my sleeping bag when I roll over at night. The shirt felt good under a 40 pound (18 kg) backpack. It is sewn with flat seams, and I have not noticed any pressure from the shoulder seams crushing into my shoulders under the weight of my pack like I have felt with other shirts . The half zip is great for controlling heat and ventilation. I hiked half a day with the shirt on under the pack in 65 degrees F (18 C) weather without getting too hot. I was able to lounge around camp with the shirt and an undershirt well into the evening without getting cold. The only item I have found that I do not like is the top of the zipper on my orange version was scratching my neck when I had it zipped up all the way. I was able to take a finger nail file and smooth it down. I did not have this problem with the black version of the shirt that I own. My fears were that the fabric would get snagged by brush while hiking or backpacking but the shirt did fine even while I was hiking through brush. It comes out of the washer looking bright and new and dries on a hanger very quickly. So far I have not had any loose threads, rips, or snags. The shirt has a pocket on the front which is too small for anything useful. Designed to be used for an MP3 type device, I feel that it would be very uncomfortable to have anything in there that would not be smashed against my chest. In my opinion it is added weight and nothing more. This shirt is light and very packable. Stretches where needed and always comes back to the correct shape. 13% spandex makes for a very comfortable fit even though the shirt is snug. Medium size fits me perfectly in the sleeve length and snug everywhere else but not too snug. I also have a black version of this shirt which fits looser than this orange one. Overall I would say this is a comfortable shirt that wears well and keeps its shape after many washings.